I’ve been tweeting about this for some time now and today it finally happened. Once my twitter account reached 100 followers I would begin a #PIDDYBOT parts giveaway; spare PCBs and 3d-printed chassis. We are now at 100 followers! If you don’t have access to a 3d printer, or don’t want to order three PCBs off of OSHpark then join in the draw! First you must be following @IHPArchives on twitter. 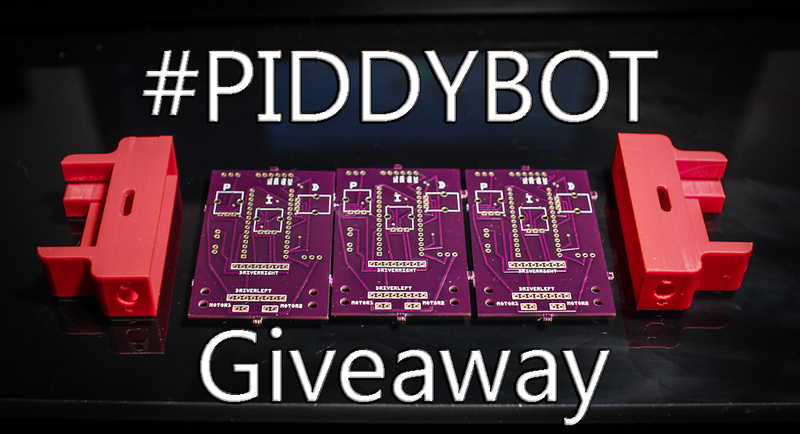 Keep an eye out for #PIDDYBOT contest and giveaway tweets and Retweet them. Only 1 Retweet required for entry. OR Instead Retweeting you can simply tweet using the button below, don’t change the message to ensure I notice your entry. After doing those two steps you will receive a PM from me on Twitter notifying you of your entry. If you don’t get a PM from me, send me one. Don’t want anyone missing out. This entry was posted in Uncategorized on February 20, 2014 by Sean Hodgins. Sorry to those who emailed my “Tips” Email! I just realized that my tips@idlehandsproject.com has not been forwarding its emails! There were a few from a while back so I apologize that I did not respond. I will do my best to get in contact with everyone! Keep sending them in! This entry was posted in Uncategorized on February 3, 2014 by Sean Hodgins.